The market was mostly flat on Wednesday. S&P 500 fell 5 basis points, the Nasdaq rose 7 basis points, and the Russell 2000 was up 0.23%. Biggest action was in the after-hours session as many tech stocks fell. During the normal trading session, the worst 2 sectors were real estate and healthcare. They fell by 0.39% and 0.49%. Best 2 sectors were the financials and energy which rose 0.39% and 0.36%. Oil prices were up 2.6% to $56.94. Saudis ignored President Trump’s tweet on Tuesday where he asked OPEC to take it easy. The Saudi Energy minister stated, "We are taking it easy. The 25 countries are taking a very slow and measured approach. Just as the second half of last year proved, we are interested in market stability first and foremost." Russell 2000 outperforming the S&P 500 Wednesday was nothing new. Small cap index is up 17.24% year to date. If you think the S&P 500 is as overbought as an index can get, you haven’t seen the Russell 2000. 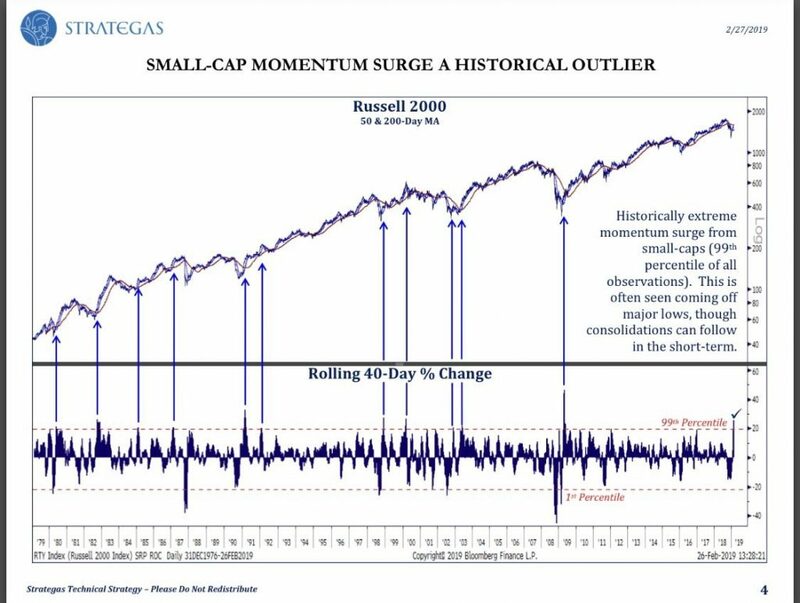 As you can see from the chart below, the rolling 40-day percentage change of the Russell 2000 is in the 99th percentile. This usually occurs after major lows. That’s obviously great news for stocks. A major low implies another bear market isn’t coming soon. Usually, small caps consolidate in the near term after this level is reached. But the over next 6+ months forward returns are better than average. The small caps might not follow the medium term average if the economic cycle rolls over. Usually, there are major bottoms when a recession is ending or a slowdown is ending. The economy never went into a recession and the slowdown isn’t over yet. As of Wednesday evening, 472 S&P 500 firms have reported their Q4 earnings results. 68% of firms beat their EPS estimates with an average growth rate of 13.5%. 61% beat their sales estimates with an average growth rate of 6.1%. 12 firms are reporting on Thursday.